Circa late 1860s. Private Collection. A stern gentleman with an Irish surname staying in Switzerland in the late 1860s, when it began to be fashionable to cut your hair shorter and slick it back. This CDV tells us it’s from 1860-1862 -it has square edges and no borders, but the man’s hair just doesn’t fit the period. Sometimes photographers used old stock; to me this was taken a few years later. Look at his waistcoat chain with the two charms, and the flower looking stud holding his neck ribbon together. He also sports neatly trimmed facial hair. A dandy, that one! He reminds me of Christian Bale. Photographer: E. Garcin. Photographe au pré Levèque. Genève. 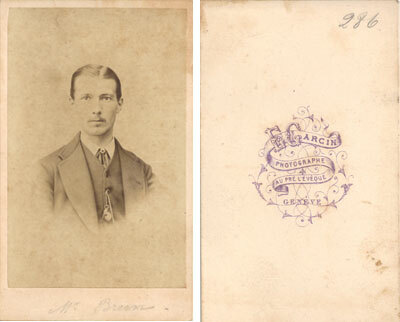 This entry was posted on Monday, April 6th, 2015 at 1:28 pm	and tagged with 1860s, E. Garcin, europe, Geneva, handsome man, mustache, portrait, Switzerland, victorian, vignette and posted in CDVs, Gentlemen. You can follow any responses to this entry through the RSS 2.0 feed.